BRING THE HORSES TO THIS ONE. SET UP TO HOUSE YOUR HORSE WITH PLENTY OF ROOM TO RIDE. 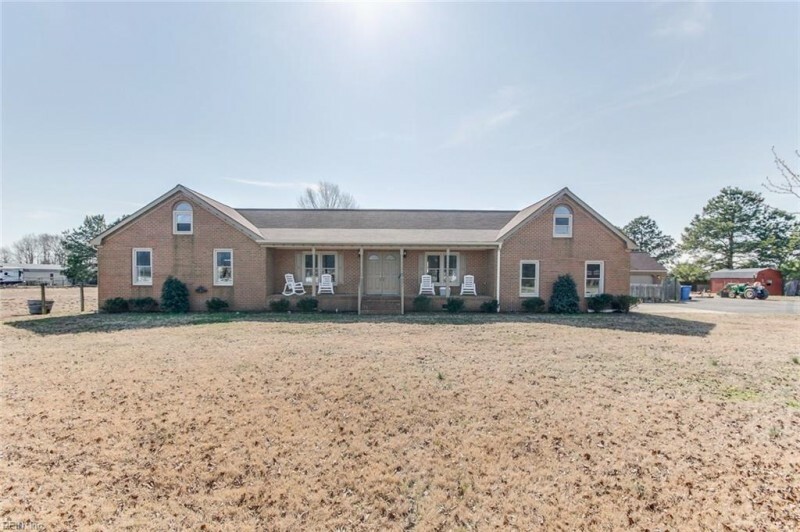 ENJOY THIS UPDATED 4 BEDROOM 3 FULL BATH RANCH IN THE HICKORY SCHOOL DISTRICT. OPEN FLOOR PLAN WILL ALLOW YOU TO COMFORTABLY ENTERTAIN YOUR FAMILY AND FRIENDS WITH NO PROBLEMS. NEWER ROOF, HVAC SYSTEM, HOT WATER HEATER AND KITCHEN CABINETS WITH GRANITE COUNTER TOPS. SS APPLIANCES, WOOD BURNING FP AND A SUN ROOM THAT IS HEATED, COOLED AND OPENS TO A LARGE STAMPED CONCRETE PATIO AREA WITH A HOT TUB TO ENJOY THE OUTDOORS. LARGE MASTER BATH WITH CERAMIC TILE AND HEATED FLOORS. ATTACHED GARAGE AND LARGE 2 CAR DETACHED GARAGE. 4 STALL BARN WITH ELECTRICITY AND WATER WILL GIVE YOU AMPLE ROOM WHEN WORKING WITH THE HORSES OR FOR EXTRA STORAGE. FENCED IN PASTURES AND MORE MAKES THIS THE PERFECT PLACE TO CALL HOME. PRICED $35,000 UNDER RECENT APPRAISAL. Ready to visit 1033 Sanderson? Request a free property tour! Send me more information about the listing at 1033 Sanderson, Chesapeake, VA 23322, MLS# 10240096. This 4 bedroom, 3 bathroom home located at 1033 Sanderson, Chesapeake, VA 23322 has approximately 2,563 square feet. It is currently listed for $475,000 and has a price per sqft of $18,533. This home is currently Active under the MLS#: 10240096. This listing is provided by Rose & Womble Realty Company. 1033 Sanderson Road, Chesapeake was built in 1994. It has Garage Att 2 Car, Garage Det 2 Car, Driveway Spc parking.The kitchen includes Dishwasher, Dryer Hookup, Elec Range, Refrigerator, Washer Hookup. 1033 Sanderson is part of the Hickory neighborhood located in 23322.